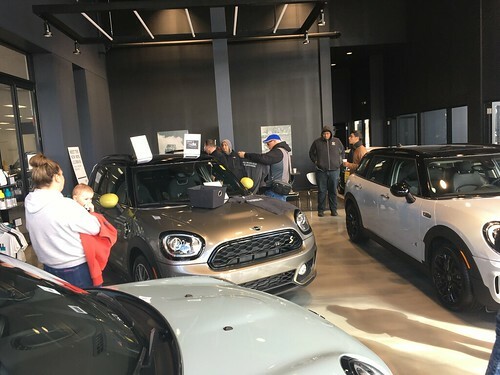 I saw the invite for the MINI Car Club of Indiana (MINICCI) Spring Fling Road Rally, and thought it would be a fun chance to take an out-of-state road trip. I had been to a drive out there last year and knew the roads and hospitality would be fantastic. The 3 hour trip (200 miles) down to Dryer & Reinbold MINI was easy cruising. I only saw 2 MINI?s on the road in the Chicago land area. Since I got down there a bit ahead of schedule, I headed over to the dealership early and hung out with a few of the MINICCI board members as they were setting things up. I have met a few of the members before, and traded e-mails with others, so it was nice to match the faces and names. More and more cars started filtering in. The final count was over 60 cars that signed up for the drive. We had a brief ?Rally 101? session , some last minute instructions, and we were off to our cars for the drive. We were given a Rally route sheet with instructions, directions, trip and accumulated mileage. The level was ?fairly easy?, although there were a few trickier instructions to keep things interesting. The other part of the rally was a set of pictures of various signs that we would pass along the way with a portion of the sign blocked out in the photo. The object was to identify the sign, and write down the exact phrase that was missing from the photo (spelling and punctuation counted, as we found out later). Since I was driving solo, I had my hands full just keeping to the route sheet. The Cars left the Dealership in 30 second intervals and headed to the first checkpoint a few miles away. This gave us a bit more room to get started on the main part of the rally. Again we left at intervals, but we still got bunched up in smaller groups due to traffic lights (and minor driver speed variations). We were all zipping along nicely in a pack of 7 or 8 cars when we came up to a turn, and all of a sudden some of the cars went one way, and some went another. Following the pack wasn?t always the best idea, as it turned out. In a few spots I was out on my own, and then I would either catch another MINI, or someone would catch me. There was a trick roundabout with instructions to take the 4th right turn, which was back the direction we started from. I wasn?t entirely sure if everyone had the same set of instructions as I often saw MINI?s coming from all directions (unfortunately we actually did have the same directions, so that meant that lots of people were going the wrong way). For 80 miles, and about 2 hours we zipped along some fantastic back roads, and finally wound up at Occasions Banquet hall in Shelbyville, about 30 miles southeast of Indianapolis. I made the whole route without getting lost, and had a great time doing it. We had a delicious dinner, and a chance to chat with new friends we met on the way. There were awards to the best scores for identifying signs, and tons of raffle prizes. The final give-a-way was a custom made MINI logo shaped rug, made and donated by one of the club members. After dinner, I had to put up with a little bit of trash-talking since I was the lone Chicago area person who was brave enough to venture down for the ride. A few challenges were made, and there was talk of some Indiana Club members making the trip to one of our upcoming Chicago events. The drive home was a bit slower due to a 45 minute construction delay at the Illinois/Indiana border while drivers figured out how to merge three lanes of traffic down to two. Glad you had a good time. The real thanks for all of it should got to the rally organizer/planner, MINICCI VP, Greg Graham. He did all the difficult work. Us board members, we just filled in where told. And, I DO still plan on getting up there for some sort of event. It was great to have you down for the rally, and glad you had a good time! It was really nice to put a face with the email address! PS..Who is the contact for the karting, I have already forgotten (it was a long and tiring weekend)? I do believe there are a few of us coming up! Glad you made it down for the rally. It was nice talking to you in the parking lot for a few minutes afterwards. I am starting to look at the Chicago area events to see if any fit in with our summer/fall schedules at home. Hopefully we will see you and other Chi-town members again at our events.